Falls happen every day. However, they can lead to especially tragic results when they occur outside of your home at a business establishment. You can suffer serious injuries that lead to you needing to pursue a personal injury lawsuit against the responsible party. As a plaintiff in a slip and fall case, you should understand that there are important factors you have to consider in demonstrating that the defendant is liable for your fall. The dangerous condition existed for long enough that the establishment should have known about the condition as it ordinarily monitored the establishment. This is the basis of your claim and ability to recover for your injuries. In 2017, a Florida appellate court dismissed a plaintiff’s claim when she was unable to show how long the substance she slipped on had been on the floor before she fell on it. It is imperative that you obtain legal help that will thoroughly investigate your claim and make all of the required arguments to ensure you are successful in recovering compensation. Last July, a state appellate court issued an interesting opinion in a slip and fall case regarding the duty that a business has to maintain the area that customers use to approach the business. The court ultimately concluded that the business in question, a Big Lots store, was not liable for the plaintiff’s injury. The court reasoned that while a business may be responsible for maintaining the immediate area of approach, the plaintiff’s injuries, which occurred about 45 feet outside of the store’s doors in the parking lot, were too remote. Notably, only Big Lots was named in this case. Had the shopping center that owned and maintained the parking lot also been named, the case may have had a different outcome. 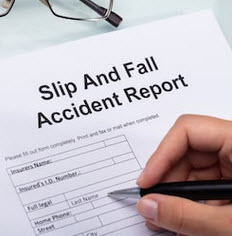 The case presents an interesting issue for Florida slip and fall accident victims and is, most importantly, an example of the necessity of carefully considering who is likely to be held legally responsible for your injuries. Unfortunately, though your claim is legitimate, every slip and fall claim is not and the background of these kinds of incidents can place doubt on your claim. WFLA News 8 recently reported that a New Jersey man has been arrested for insurance fraud after a video that showed him faking a slip and fall injury was recovered. According to authorities, the investigation revealed that the man purposely threw ice on the floor before placing himself on the ground and waiting to be discovered. An attorney who is experienced in handling slip and fall cases can help you show that your claim is legitimate and that your injuries did not result from your own negligence. If you or a loved one has been injured in a fall that occurred because of the negligence of a property owner, you may be entitled to monetary compensation through a Florida premises liability lawsuit. We have represented hundreds of victims of slip and fall injuries who have suffered the same types of injuries as you and helped them get the compensation they needed, just as we can help you. Contact the Florida slip and fall attorneys at Leifer Law Firm today and we can discuss your legal options for free.